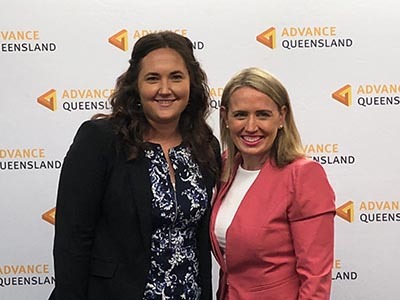 Dr Jaime Manning was presented with her Advance Queensland Industry Research Scholarship this week by Queensland Minister for Innovation Kate Jones. A CQUniversity Rockhampton researcher will assess the ability of smart ear tags, developed by the Australian Wool Innovation (AWI), to help farmers detect diseases in their sheep, thanks to the support of an Advance Queensland Industry Research Fellowship announced last week. Dr Jaime Manning is one of 30 researchers being supported by the Queensland Government through the $7.2 million research fellowship program. The fellowships support researchers who are working in collaboration with an industry partner and who are undertaking original work that will have a positive impact on Queensland. “With the Industry Research Fellowships, we are keeping the State’s best and brightest research minds in Queensland while attracting talented researchers from interstate and overseas,” Minister for Innovation Kate Jones said. 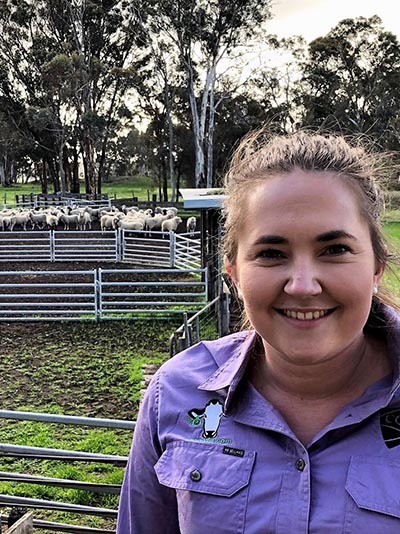 Dr Jaime Manning has received funding to test AWI’s smart sensor ear tags and address animal health and wellbeing issues faced by Queensland woolgrowers. Dr Manning will work with the Australian Wool Innovation (AWI), the Central Queensland Livestock Centre of Excellence and the Queensland Agricultural Training Colleges (QATC), to test and evaluate the sensor system developed by AWI. “Queensland sheep producers are in need of new technologies, such as the AWI smart sensor ear tag, to automatically detect issues affecting their animals,” Dr Manning said. “Our research will evaluate whether the smart tags are rugged enough for Queensland’s environmental conditions and develop animal behaviour algorithms so farmers can be automatically alerted of any arising health issues and undertake immediate intervention. “The applications we are focusing on are the detection of predator attacks, as well as more subtle behaviour changes associated with disease development in sheep. Sheep producers face significant financial burdens due to predation events and disease and with the majority of predation affected producers based in Queensland, Dr Manning believes this research is vital for the Queensland sheep industry. “There are reports that 50 per cent of the Queensland sheep population is being impacted. In conjunction with the economic impact of wild dogs and predation events, there are also serious welfare and social license implications. Dr Manning said by the conclusion of the project, sheep graziers across Queensland will have access to a smart ear tag sensor system that provides data on key animal behaviours and remote alerts for predation and key disease issues. Ms Carolina Diaz, Program Manager, Farm Automation and Reproduction at Australian Wool Innovation said the trial would lay the groundwork for the new smart tag technology to accurately detect welfare issues occurring in real time, and even predict issues about to occur. “The trialling and evaluation of this technology will allow woolgrowers to make better-informed management decisions earlier than ever before,” Ms Diaz said. “On-animal sensors have the potential to give woolgrowers the opportunity to monitor their livestock just as if they were shepherds in the paddock. The key benefit of the sensors is they monitor sheep activity, behaviour and health 24 hours a day, seven days a week. Dr Manning’s research project will commence in early 2019 and will run for three years. The fellowships are part of the $650 million whole-of-government Advance Queensland initiative to foster innovation and build a more diversified Queensland economy, creating jobs now and for the future.